At CFW Precision Metal Components, water jet cutting is one of our primary capabilities. We have the technical proficiency to make precise cuts in a variety of materials, including those that are heat-sensitive, delicate, or exceptionally hard. Using powerful software design tools and integrated CAD/CAM technology, we optimize setup and run times for both efficiency and cost savings. Our water jet cutting services offer advantages over other production methods. 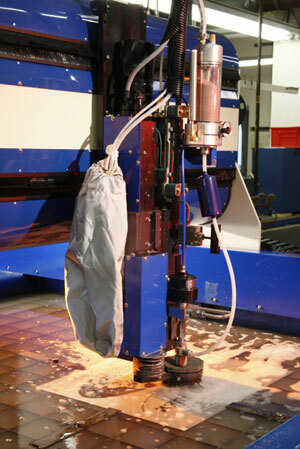 Water jets concentrate an extreme amount of energy in a small area to create clean cuts with smooth edges. There is no heat-affected zone to cause thermal distortion or work hardening and the need for secondary machining is reduced or eliminated entirely. Using the very latest programming tools, we can control cutting speed to make intricately detailed cuts in any materials, and these same software tools allow us to create efficient layouts to produce the maximum number of parts from every sheet of material. Generating up to 50,000 psi cutting force and featuring a 51” x 51” worktable, our water jet cutting equipment cuts 2D shapes in almost any type of sheet material. We process metals of all kinds, from standard grades to hardened steels and high-performance alloys. Using our water jet equipment, we also cut through a wide variety of non-metals, including plastics, ceramics, composites, stone, granite, and many other materials. Maximum sheet thickness varies by the type of material, and in many cases, we can make accurate cuts through multiple layers. Serving companies in the aerospace, electronics, marine, military, and commercial industries, we can produce cost-effective prototypes using water jet technology and quickly ramp up to production levels of 5,000 units or more. With our ISO 9001 certification, you can be confident in the quality of our products. To learn more about our water jet cutting capabilities, Contact us today.